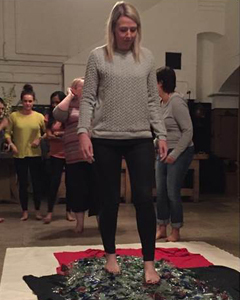 Vulnerable feet were put to the test in aid of vulnerable people last Thursday when Marie Elliott, General Manager of Leicester-based IT services company SHBS Ltd, took to broken glass and hot coals at Belvoir Castle. The sponsored event, in aid of Leicester Charity Link, saw the participants take to the kitchen of the Castle to walk over a 5 metre bed of broken glass. Having survived, the group then went to the garden and repeated the exercise, but this time over 500 degree hot coals. “I think most people think I am mad”, said Marie. “But for me it was a real mind-over-matter challenge where the ends most certainly justified the means”. To date Marie has raised £340, well over her £150 target. “It is not something that I would necessarily do again but I am really proud to have achieved it and to support the charity in this way”. Leicester Charity Link provide everyday items that the majority of us take for granted, such as a bed to sleep in, a cooker to prepare a hot meal and, in emergencies, food. These items may not cost much, but they can make a massive difference to people’s lives. The charity supports over 8,000 people in the area who are experiencing poverty, hardship and crisis. To help support Leicester Charity Link, donate through Marie's Just Giving page.